I took my mother and sister out for shopping at MUJI in Downtown San Jose, and afterwards we went to get some nem nướng cuốn! 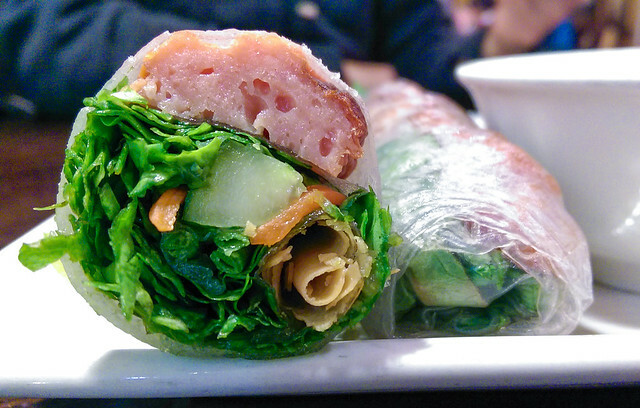 Nem nướng cuốn literally means ‘grilled pork roll’. They may also be described as ‘spring rolls with grilled pork patties’ at some places. We ordered two rolls for $4.00 USD. You can also get four rolls for $8.00 USD. 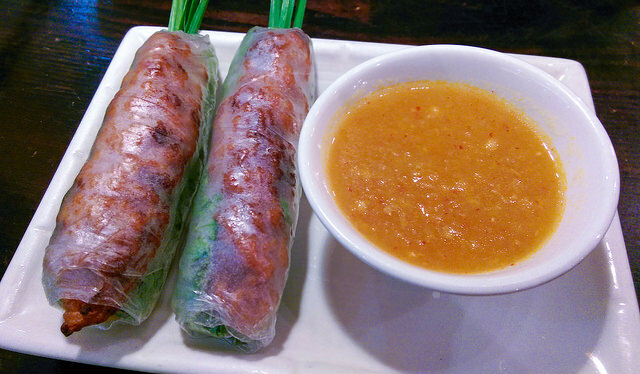 These spring rolls have grilled pork (nem nướng) with fried egg roll wrapper, lettuce, herbs, chives, carrot, daikon, and cucumber, wrapped with rice paper (bánh tráng). They are also typically eaten with a warm, sweet and tangy orange sauce. The fried egg roll wrapper inside the grilled pork roll added an extra crunch to every bite. The rolls dipped in orange sauce was a very bold combination with lots of flavor! now those look delicious!! i also have never seen this particular style of cuon! !